This sketchup video tutorial is a part of sketchup skill builder series. The video will teach you how to apply layered watermarks to your sketchup model for the betterment of the model. The watermarks can be provided to the backgrounds and overlays on top of model. To apply watermarks, go to styles window and click on edit button and choose watermark tab. 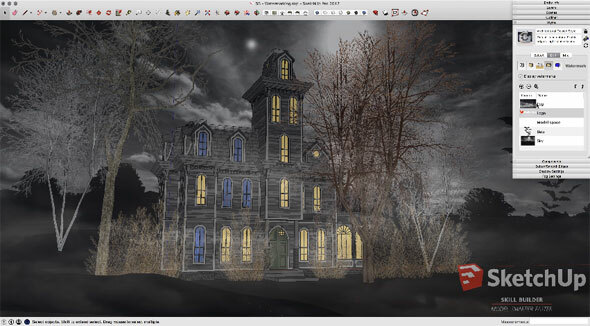 In SketchUp, the watermark feature can arrange a graphic ahead of or behind your model. A watermark can be added for its conventional purposes like adding a company name and logo into your model. Besides, watermarks also contain creative applications which range from providing a background image to produce a unique model setting or overlaying your model with transparent or cutout image (as for example binoculars). To learn how to add a water mark to your model, go through the the following sketchup video. DISCLAIMER: "Sketchup, Autodesk, AutoCAD, Revit, Navisworks, QTO, 3ds Max, are registered trademarks. All other brand names, product names, or trademarks belong to their respective holders."